Winning the lottery is a one-in-a-million thing, a chance of a lifetime. Although that sounds almost like the lyrics of a famous old song, this is how players feel about this game of sheer luck. There are people who are against it, but did you know that it is mostly for a good cause? 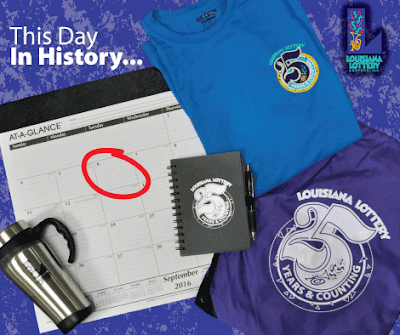 Lousiana Lottery, for instance, has been giving a portion of their earnings towards the K-12 education, and this is the 25th year since they first did it. See, they even prepared a promotional collection consisting of calendar, shirts, tumbler, notebook and pen for some lucky lottery players. More Satisfied Consumers. Getting a free T-shirt or a free pen is already good, but receiving a promotional collection of stuff that can be used in everyday life? That is fantabulous! The more items the brand can give away, the more satisfied their consumers will be. Costless Additional Marketing. As a brand owner, you may have to pay for the manufacturing of your anniversary giveaways. However, making your name known to other people beyond your reach will be costless, since your consumers who got the freebies will do that for you – consciously or subconsciously. They can outright talk about the awesome promotional products they received from the brand, or their officemate borrows the pen, or they display the calendar in the common room. Give your anniversary giveaways a personal touch. Find out how on our blog. The Chicago White Sox have been batting for victory since 1901. Yet, their home since 1991 is and has long been the U.S. Cellular Field. This Major League Baseball team has experienced a lot of memorable games in this ballpark where some of the best players, like Mark Buehrle, A.J. Pierzynski, Paul Konerko, Carlton Fisk, and Scott Podsednik, among many others, have poured their heart and soul into achieving wins for the group. Now that the ballpark is turning 25 years old, the White Sox will be playing there once more during their Homecoming Weekend. As part of the celebration, on May 21st, they will be giving out anniversary canvas giveaways to 20,000 fans in the stadium! Good Times are Not Forgotten. The promo gift is going to 20,000 homes after the game. More likely than not, they will end up in a fan’s room or dead-center in the living room where people can always look at it and bring a smile to their faces. This smile comes not mainly because they actually got the item, but because they remember the good times when this or that player was still with the team. Uplifts Brand Value. We have always been told that we don’t realize how much time we have consumed if we are enjoying what we do. 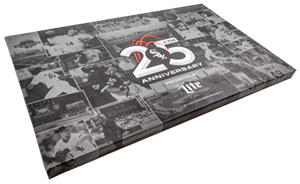 What the brand is doing with this photo collage is that they are recalling the memories that the baseball team has had in the ballpark, and true-bloom Chicago White Sox fans may be able to relate to every image in the canvas as well. Thus, it uplifts the brand value. We can help you make your anniversary giveaways take that extra leap. Browse through our blog now. Nathan’s Famous is truly famous when it comes to juicy hot dogs, and it has been for exactly a century now. It started as a family business, but now it has expanded globally and even has covered several other large fast food chains from America. Their biggest anniversary treat for their loyal supporters is that, for a limited period of time, they are bringing back the original price of their hot dog to 5 cents. Just like the old times, eh? In addition to that, they have prepared 100 wooden coins when you pre-register to their promotion. What Makes This Anniversary Giveaway Extraordinary? It’s classic. A classic giveaway for a classic brand. 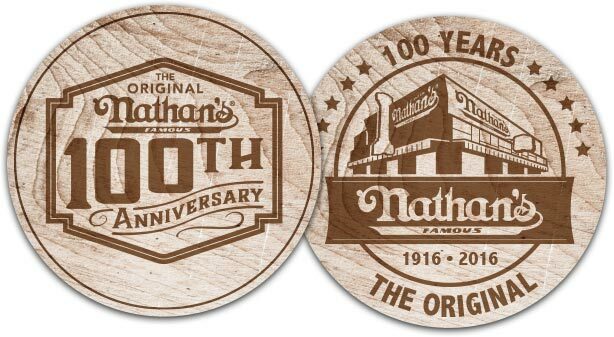 This must be what Nathan’s Famous is going for when they thought of giving away wooden coins. They have gone past their silver and golden anniversary; they are in their centennial anniversary now. Being able to achieve that three-digit number is such a huge milestone for anyone – or for any brand, for that matter. It’s well-designed. The image above clearly shows the two faces of the coin, and you can see that it is so intricately designed with little things that mean so much for the owners of the brand. There’s their logo, the year when they started, and the drawing of their original restaurant where it all began. It brings back good memories. In one way or another, Nathan’s Famous has been a part of its consumers’ lives. Parents might have gone on their first date there, school friends might have hung out there after classes, or eating Nathan’s Famous’ hot dogs must be the kids’ prize back then for getting good grades. Whatever memory it is, the wooden coin can bring all those back. If your business has been running in single-digit years, you may want to check out our blog for more success-ensuring promo strategies for the years and years to come. When a product is launched, brand owners have this understandable fear that what if their consumers cannot appreciate this thing that they have spent months working on? If that’s the case, this will hurt not only their egos but also their profits. But let us think of how people behind beauty brands feel whenever they release collections of products. That must be a thousand times more nerve-wracking, right? 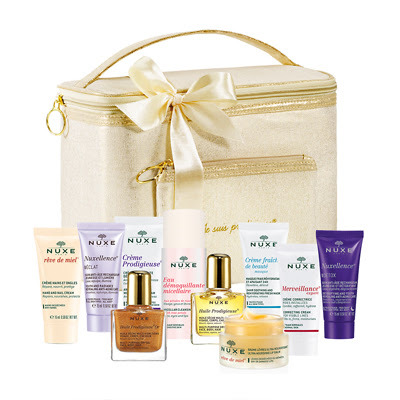 Because of this, it is simply reasonable for NUXE Paris to memorialize their 10th anniversary with a gift with purchase that is up for grabs at the FeelUnique website. Why Gift with Purchase as Anniversary Giveaway? It increases brand’s profits. It is quite nice to keep earning while still celebrating. Gift with purchases during company anniversaries usually have the regular products given away at almost have their original value, so that’s one gift already. Then there is the actually freebie that comes with the purchase. This is what increases the brand’s profits. It makes brand more popular. Within a circle of friends, when one of them loves skincare or beauty products, it’s impossible that she’s the only person that loves such things. Isn’t it that birds of the same feather flock together? So, if someone gets this NUXE anniversary giveaway, she will tell her gal pals where she got it, and then these people can become new or returning customers. Thus, it makes brand more popular. Make your company anniversary more sensational with the help of some marketing ideas from the blog. Treating pets like your own child, dressing them beautifully and sometimes even giving them their own room is the new trend these days all over the world. They have become more than just a man’s best friend – dogs, cats, horses and all animals are included. However, not all of them are lucky to have owners who see them as a part of their family, and they often are the ones that get abandoned, or worse, abused. This is what the Animal Society for the Prevention ofCruelty to Animals (ASPCA), a non-profit organization, has been trying to avoid for over a hundred years already – 150 years, to be exact. They have been rescuing the unfortunate animals from the streets or from anywhere else and helping them get the better life they deserve in the hands of nicer and more loving people. And for their 150th anniversary, they are encouraging animal lovers to volunteer some of their time and help them do good deeds to these beautiful souls for 150 days. In addition, FiveSibes partners up with them to send a wonderful collection of anniversary giveaways to a good number of people who will enter the giveaway contest at their website. More Sponsors and Volunteers. There are folks out there who surely want to help animals, yet they do not know how. Now, thanks to the connectivity that internet brings, a lot of them may be able to see this through web search, and they will want to donate their time or money to join the cause. Higher Consciousness About ASPCA. Humans always have a soft spot for animals, and vice versa. No one has to be super fond of pets to the point of letting them share their bed before they feel for the animals. 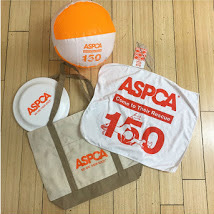 The anniversary giveaways will help make people become more conscious of the fact that ASPCA exists for such reasons. If your company anniversary is coming up, check out our blog to see how you can commemorate it with fun giveaways. Blood is literally and figuratively thicker than water. Family members who put up a business together may have greater edge at achieving success, as they already know one another. This is most probably the case of Tom and Joe Cassidy, the brothers who have founded the company called Cassidy Brothers in the middle of 20th century. The name has been transformed into Casdon last 2010, but the initial goals of the company lives on up to this day that they even celebrating their 70th anniversary. 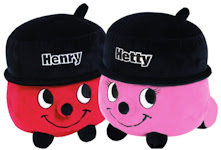 70 of their widely known plush toys Henry and Hetty will be given to the same number of fans who will participate through their Facebook and Twitter channels. How can this add to the popularity of Casdon? They are something to remember the company by. Not all companies reach 70 years, much less 7 years or 7 months, that’s why this is truly a great milestone for Casdon. By giving away a couple of the toys that their customers know them most for, it reminds people about what the company is all about. Hence, this reinstates the place of Casdon to their minds. The power of social media is very much alive. To the technical side of things, the company will be even more popular because they have gone virtual for their anniversary giveaways, and this means that they reach practically anyone around the globe. More people will hear about this, and more people can turn into actual customers in the future. Reestablish connections with your avid customers with the help of some anniversary giveaway ideas from our blog. Star Media Group is a Malaysian newspaper company which published its first tabloid in the province of Penang in September 1971. While most novice publications experience bankruptcy after a couple of years, Star Media refused to end up on that same downhill path. It may still be a rocky road, but their ideals for the company is stronger than the difficulties they have had to face through the years. And look at where they are now? The localized tabloid has branched out to other places in the country, and the news are not only seen in prints but also in their online sites. True, Star Media Group is doing well – so well, in fact, that they are playing host to a lot of giveaways this year for their 45th anniversary. For their first giveaway, they will be sending out dashcams to 45people who will answer their contest form in a very creative manner. Subscriptions may increase. When the news gets out that Star Media Group will be giving away some cool items, it is possible that more people will get subscription to their newspaper and other news portals, in the hopes of getting more information about the contests. It adds to the consumers’ excitement the idea of not knowing all the giveaways until such time that every contest period opens. Customer loyalty is fortified. Anniversary giveaways can fortify the loyalty of the publication’s customers, because it gives them the idea that the newspaper company they are supporting is top-notch, as it can send forth a great number of high-tech gadgets, and maybe even more, that can help get more new stories from the places which their reporters cannot always reach. If you want your company to reach over 45 years in the industry too, visit our blog to get more ideas about anniversary giveaways.